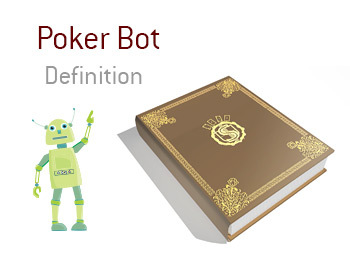 What does the term "poker bot" mean in the world of poker? What is the definition of the term "poker bot"? In poker, a "bot" is a computer program that automatically plays hands of poker without human intervention. At most poker rooms, "bots" are illegal and you will most likely have your account banned if you are found to be using a "bot". Most "bots" are extremely simple (if I am dealt this hand in this position, do this) while other "bots" are more complex and change their playing styles based on their opponents style of play. Most "bots" that you will encounter on online poker sites, however, are very simple and are simply looking to exploit beginner players who are likely to make stupid mistakes. There have been numerous "bot rings" exposed over the years. These "bot rings" look to play many, many tables at a time while extracting profit from other players. Some "bot rings" have been very successful (based on public tracking sites), while others have surely failed. Some "bot rings" have been exposed and brought to justice (account banned, funds seized), while others are surely operating undetected. The biggest attraction of using a "bot" is that it can play tirelessly on a practically unlimited number of tables. The human brain tires - the computer brain does not. Poker Bots Are Everywhere: Do you Care?